This is a most amazing city that got completely bombed in WW II but bounced back better than ever completely rebuilt. It has lots of interesting architecture to delight the eye. 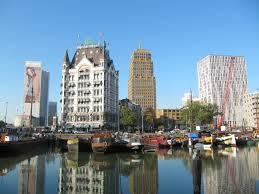 Rotterdam is located in South Holland, the Netherlands. The city sits on the Rhine-Meuse-Scheldt river delta at the North Sea. Today it is home to Europe’s largest port. 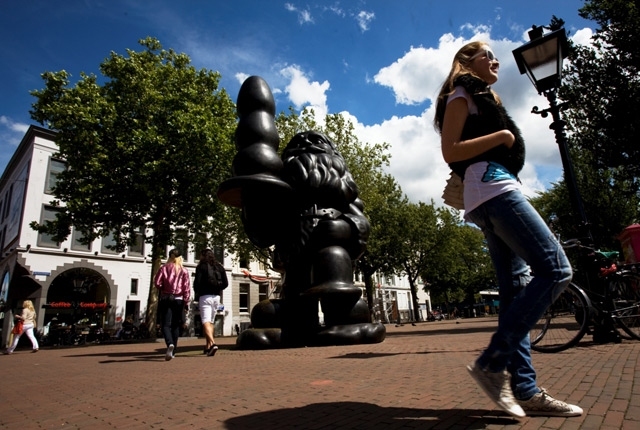 There are many different things to do and see here such as the controversial “Santa Claus” statue in the main shopping district created by American artist Paul McCarthy. Locally the statue is known as “Buttplug Gnome” and it is part of the Westersingel Sculpture Route. 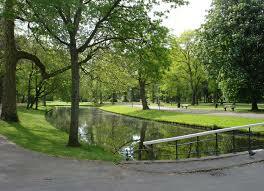 Take a walk along the Westersingel Canal and follow the sculpture route. 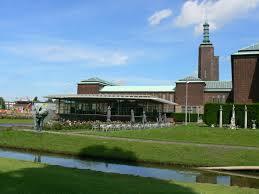 Here you’ll see different works of art from Rotterdam’s International Sculpture Collection. This route features 17 artworks by major sculptors like Rodin, Carel Visser, Joel Shapiro and Umberto Mastroianni. The Museum Boijmans van Beuningen offers visitors a permanent collection that spans all eras of Dutch and European art. Among the highlights here are The Marriage Feast at Cana by Hieronymus Bosch, The Three Maries at the Open Sepulchre by Van Eyck, Tower of Babel by Pieter Brueghel the Elder and Portrait of Titus and Man in a Red Cape by Rembrandt. There is a lot of art to see from the Italian Renaissance as well as paintings and sculpture from the mid-19th century. Of interest are paintings by Monet and other French impressionists and statues by Degas. They have a large collection of artworks by Salvador Dali. There is a lovely sculpture garden and a cafe in which to relax. Kinderdijk is a UNESCO World Heritage site where you can see 19 windmills along both sides of canals. You can either walk the route or cycle. 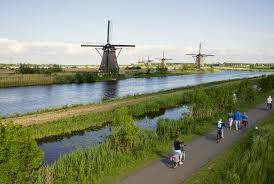 It is a most beautiful area with the windmills hovering over the empty marshes and waterways. Here you’ll find several of the most important kinds of windmill among them hollow post mills and rotating cap mills. The rotating cap mills are among the highest in the country being built to better catch the wind. All of the windmills are kept in operating condition and they date back to the 18th century. In the summertime tall reeds line the canals, lily pads float on the water and you can hear bird calls. There is an old pumping station that shows a film about Kinderdijk. On July and August Saturdays from 2 PM to 5 PM most of these windmills are in operation. 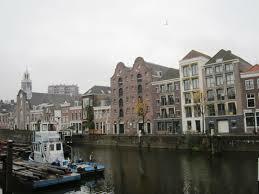 A wonderful district for strolling and taking a look at the sights is charming Delfshaven. This particular area was once the official seaport for the city of Delft. 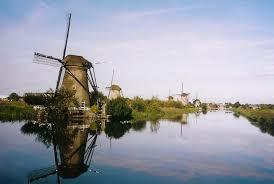 At Voorhaven 210 you’ll see a reconstructed 18th century windmill by the water. This is the place from where the Pilgrims attempted to leave for America aboard a leaky vessel called Speedwell. You can take a look at the Oude Kerk or Old Church on Voorhaven where the Pilgrims prayed one last time before they set sail on July 22, 1620. Inside you can see models of boats. To the west on Schiedamseweg you’ll find ethnic grocery stores and eateries. There are walking-tour brochures available for Delfshaven. 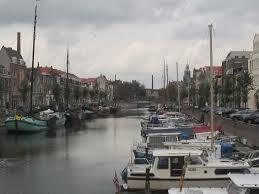 The Oude or Old Haven area preserves the oldest part of the harbor with some place dating back to the 14th century. It’s wonderful place for strolling and viewing the large collection of historic boats. Take a look at the Openlucht Binnenvaart Museum which has a collection of historic inland waterway boats filling up much of the basin. 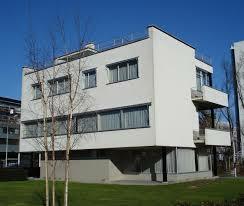 An impressive example of the Dutch New Building architecture also known as Dutch Functionalism is Huis Sonneveld. This villa dating from 1933 was designed by Brinkman and Van der Vlugt. It has been restored and has furnishings, wallpaper and fixtures from the time it was built. The Overblaak Development is a most fascinating apartment project. 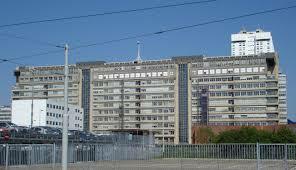 It was designed by Piet Blom and built from 1978 to 1984. It is located near the Blaak metro station and is known for its pencil-shaped tower and 45-degree-tilted, cube shaped apartments on hexagonal pylons. 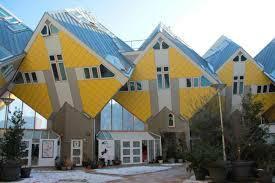 One of the apartments is the Kijk-Kubus Museum House and is open to the public. It is a furnished home with models, photos and computers explaining architect Piet Blom’s cube project. 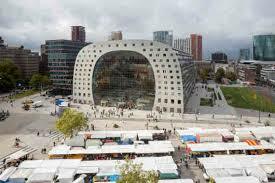 At the southern end is a large-sized cube that is home to the Stavokay Rotterdam Youth Hostel. Visitors enjoy seeing Blaak Market, a huge market stretched across a square bearing its name located right across from the cube houses. There is also a new indoor market. You can find anything and everything for sale here from food to gadget to clothes to antiques and more. If you like you can pick up snacks and sample the food. For rest and relaxation head for the lakes of Het Park. In the summertime you can find the residents of Rotterdam barbequing on the grassy lawns. To the east is Tuin Schoonoord, a recreation of an idealized Dutch wilderness making you think you stepped into a Renaissance painting. 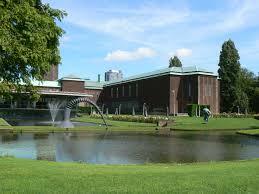 Within the Villa Dijkzigt, a national monument that was built in 1852 is the Natural History Museum of Rotterdam. Villa Dijkzigt was built from 1849 – 1852 in the neo-Classic style by architect Johan Frederik Metzelaar. It was commissioned by the Van Hoboken family. 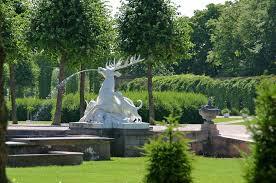 The Land of Hoboken is a 60 acre estate located between Rotterdam and Delfshaven. The villa gave its name to the adjacent Dijkzigt Hospital which opened its doors in 1960 but has been known as Erasmus MC since 2002 and the new district Dijkzigt. 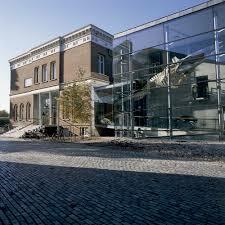 The Natural History Museum of Rotterdam was extended with a modern glass pavilion. Here you can see a collection of more than 25,000 objects from dried plants to fossilized mammoth remains. This is one of the largest natural history museums in the Netherlands. The museum offers a variety of different exhibitions, activities, educational programs, conducted tours and options for children’s parties. The Erasmus University Medical Center is affiliated with Erasmus University. It houses the Faculty of Medicine and is considered to be the “largest and one of the most authoritative scientific University Medical Centers in Europe”. 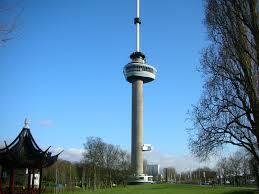 For awesome 360-degree views of Rotterdam head on up the 185m Euromast to the 100m high observation deck. The World Museum offers a look at contemporary and past cultures. The permanent collection The Collection has 2000 masterpieces from around the world. Altogether there are around 100,000 items and 100,000 photos dating from 1860 albums, prints, maps and atlases, drawings, slides and posters. The museum building was once the Royal Yacht Club of Prince Henry in the 19th century. 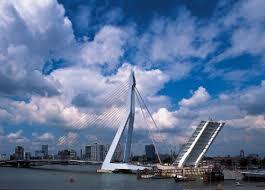 One of the icons of Rotterdam is the Erasmus Bridge. This is one of Holland’s most famous bridges and was officially opened in 1996 by Queen Beatrix. It is an important connection between the Northern and Southern parts of Rotterdam. This amazing bridge was created by Ben van Berkel. 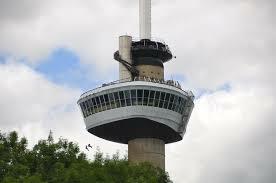 It is 800 meters long and has a 139 meter high pylon fastened by 32 stays. The bridge is also known as “The Swan”. The Erasmus Bridge has been part of many different events like Hollywood movies, Red Bull Air Races, dance events and the start of the 2010 Tour de France. At the foot of the bridge is the Wilhelmina Pier where you can see lots of impressive architecture, culture, restaurants and hotels. There are many residential buildings as well. Do take the time to visit the Rotterdam Zoo in the Biljdorp district to the north of the city. There are so many fascinating things to see such as the African Savanna, with the infamous gorilla Bokito and his family, the glass tunnel through the Oceanium and the Asian Jungle Trek. Of interest is Amazonica Europe’s largest butterfly paradise. Here thousands of South American butterflies flit about enjoying flowers and sharing their tropical temperatures with anacondas and piranha fish. At any one time 8,000 visitors can visit the zoo and guided tours are available. One interesting package is Rotterdam Zoo by Night where visitors are taken about the shadowy zoo after closing time and can enjoy a buffet dinner. One of the highlights of the Rotterdam Zoo is the Oceanium where visitors take a fantasy journey across the sea bed and along the coast while viewing underwater and coastal animals. You can delight in playful sea otters and view sharks and snakes. Making their home here from the Galapagos Islands are King penguins and giant turtles. 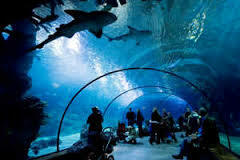 For a truly unique experience take the shark tunnel. 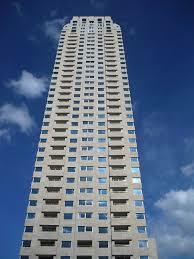 Het Witte Huis or White House Office Building rises up eleven floors to a height of 45 meters. It was the first Dutch skyscraper to follow the American example. There is a panorama platform on the roof that is open to the public. 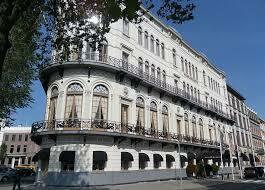 On the ground floor you’ll find the Grandcafe Het Witte Huis. The Museumpark was designed by W. Molenbroek and is divided into four zones – a paved zone, a romantic zone with trees and a pedestrian bridge, an asphalted city zone for events and a well-tended orchard. The car park was designed by Paul de Ruiter and has split levels with lots of glass to give it plenty of light and a spacious and transparent look. The water reservoir prevents flooding in the city center when heavy rains fall. Opposite the Museum park is the Queen Emma Square built between 1888 and 1891. 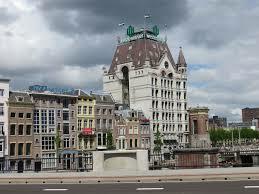 It was designed by JC van Wiljk and has 15 mansions in the neo-Renaissance style. The backs of the buildings overlook the Schoonoord Park and the fronts overlook the land of Hoboken. The elite of the Rotterdam business world live here. On the square is a decorative vase designed by Berlage in 1890. This square is a national monument and has the status of a conservation area. 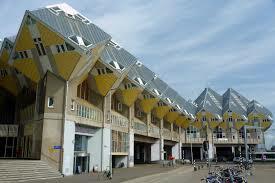 The richest area of the Netherlands is the Maritime Quarter or Sheepvaartkwartier. Here you can find lots of monuments, luxurious apartments, historic warehouses, museums, a historic harbor and some of the finest restaurants in the Netherlands. Westelijk Handelsterrein are majestic warehouses located under a glass roof. There are modern art galleries, shops and restaurants. 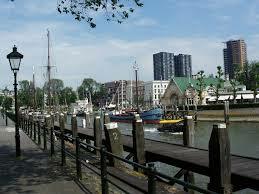 You can get a look at what Rotterdam was like in the 19th century at the historic Veerhaven Harbor. Visitors can view traditional seagoing sailboats and yachts. 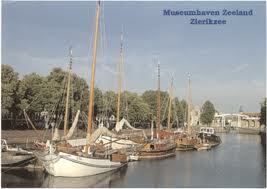 In the past the harbor was used by the wealthy Royal Dutch Yacht Club where the World Arts Museum is housed today. 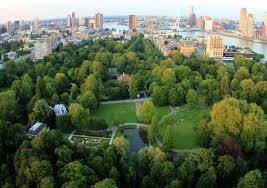 Rotterdam has its own Central Park known simply as The Park. This is the oldest park in the city. 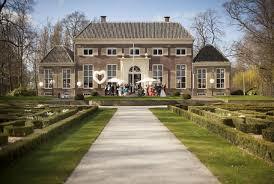 Visitors can see the Heerenhuys Villa which is now used for different events and weddings. 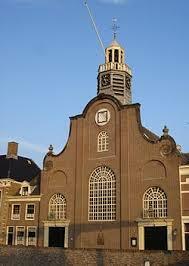 Nearby is a 17th century style Norwegian seamen’s church given to Rotterdam when Norway became an independent country. The Euromast can be found at the west side of the park. Rotterdam has some impressive skyscrapers like the 43-storey residential skyscraper Montevideo on the Nieuwe Maas River. It is well-known for the large letter “M” on top making the tower’s height at 152.3m. It was designed by the Mecanoo architecture firm and has 192 apartment units and office and retail space. The tower was named after the capital of Uruguay. Another residential skyscraper also 43-stories high is New Orleans. It was designed by Alvaro Siza Vieira. 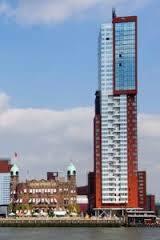 At 158.3m height it is at present the tallest residential building in the Netherlands. There is plenty more to do and see in Rotterdam. Rotterdam looks wonderful. We’re off to Amsterdam in a few weeks. You certainly put a great deal of work into your posts. Thank you. You welcome Chris. Hope you have a great time in Amsterdam. Perhaps I’ll get the writing done on this one before you go.